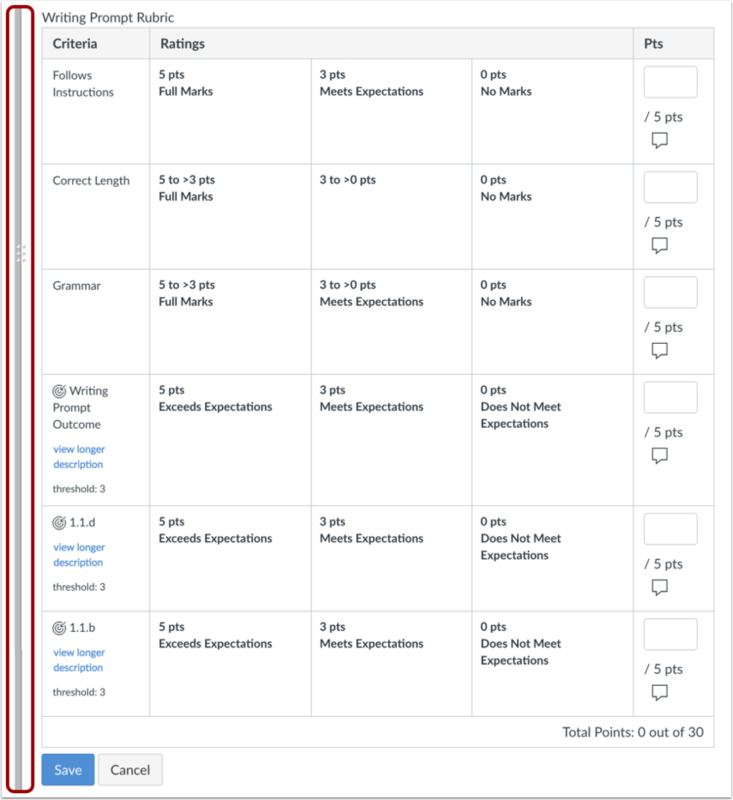 If you have added a rubric to an assignment, you can assess the rubric in SpeedGrader. If you want to use the rubric to calculate a grade, be sure you have selected the Use this rubric for assignment grading checkbox when adding a rubric to an assignment. Make sure this checkbox is selected before you begin grading submissions. If you do not select the rubric specifically for grading, you can still use the rubric to evaluate an assignment but the score will not update automatically. 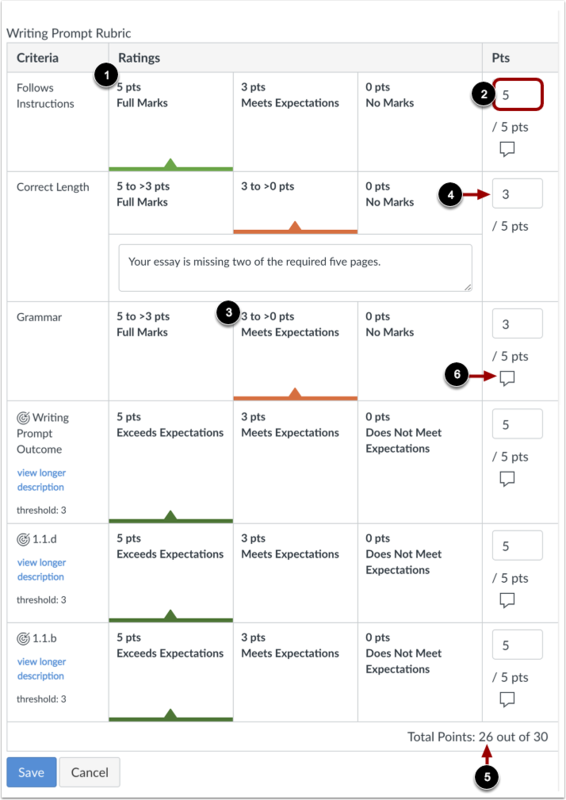 If your rubric includes outcomes, you may be able to assign extra points for the outcome criterion if this feature is enabled for your course. 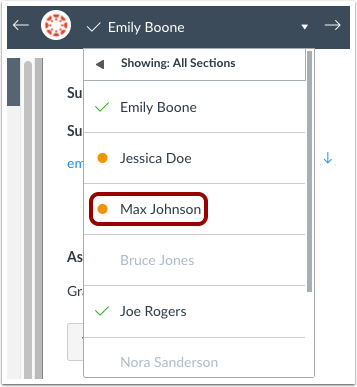 Learn how to manage feature options in the course features lesson. If your rubric does not contain any predetermined rubric criteria, you should grade the rubric using free-form comments. If your rubric does not contain any point values, you should grade the rubric as a non-scoring rubric. For each criterion, click the rating that applies to the student's submission . The selected rating displays the rating value in the Points field . If a criterion includes a range, clicking a rating selects the entire range and defaults to the highest value in the range . To select a different value within a range, type the value into the Points (pts) field . You can manually enter points above the criterion maximum point value. Each criterion value adds to the student's total points . Outcomes may also be able to support additional points. If additional points on outcomes are not retained after the rubric is saved, this feature has not been enabled for your course. If you set your rubric for grading, the rubric points will be automatically populated in the grade field. Otherwise, you can enter the grade from the rubric manually. Previous Topic:How do I audit an assessment in SpeedGrader? Next Topic:How do I use free-form comments instead of ratings in a rubric in SpeedGrader? Table of Contents > SpeedGrader > How do I use a rubric to grade submissions in SpeedGrader? I've checked "use this rubric for assignment grading", and have graded the assignment using the rubric in speed grader, clicking "save" beneath, but the grades are not populating in the grade book. Re: Does Canvas allow a professor to attach a file to the grading comments?